Ask a question about PRE-ORDER: Pinhead Deluxe Mask and Display Stand. You will earn 109 Reward Points by purchasing this product. Keep your masks standing a head above the rest. 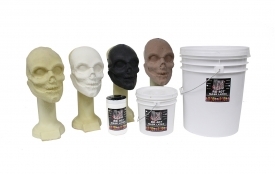 RAD (Radiant Assisted Demold) Technology™ provides an easy, built in clay release system which dramatically aides in the demolding process for artists and mask makers using wax based clay mediums. 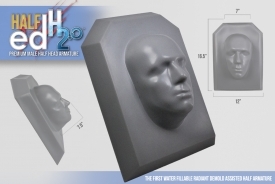 Each RAD enhanced headform becomes, in effect, a hot water vessel which efficiently transfers radiant heat from inside the form to the surrounding clay causing a softening effect within the mold. Molds made over RAD enhanced forms can be demolded rapidly and without difficulty, resulting in a greatly improved mold-making experience. When you are ready to demold, simply turn the mold over with the bottom side up, unscrew the included inset bottle cap and fill the head form with hot water. Within minutes, radiant heat will begin to penetrate the clay and into the mold for the easiest demolding experience you've ever had. 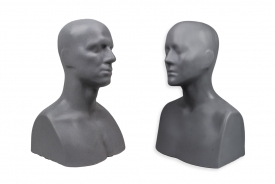 Say goodbye to broken or stuck head forms! Showcase YOUR Spectacular creations with the all new Monster Makers Pinhead! The Pinhead measures 15” H x 6” W x 5.5” D with a circumference at the brow of 20.5” approximately. 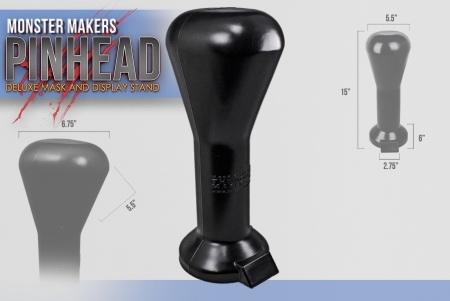 Each display stand is supplied with a black plastic cap to seal the bottom spout.